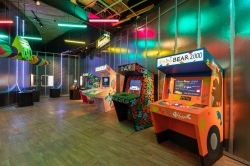 • Video games – their design and use both in terms of gaming but also in pushing boundaries – are the subject of a new exhibition opening at the V&A this Saturday. Videogames: Design/Play/Disrupt will provide rare glimpses into the creative process behind games like The Last of Us, Journey and Kentucky Route Zero through original prototypes, early character designs and notebooks as well as cultural inspirational material ranging from a Magritte painting to a viral cat video. The display also features large scale, interactive and immersive multimedia installations featuring games like Minecraft and League of Legends, and explore how major technological advancements have transformed the way games are designed, discussed and played. Runs in Room 39 and North Court until 24th February. Admission charge applies. For more, see vam.ac.uk/videogames. PICTURE: V&A. • An exhibition revealing some of the historical artefacts found by some of London’s most prolific Mudlarks along the banks of the River Thames opens on Tuesday as part of Totally Thames. Hannah Smiles has been taking the pictures over the past year and they capture everything from Tudor-era pins to World War II shells, medieval pottery, human teeth and even messages in bottles. The photographs and artefacts themselves both form part of the display. A series of talks by Mudlarks accompanies the free display. It can be viewed at the Art Hub Studios, 5-9 Creekside, in Deptford until 16th September. For more information, head to www.totallythames.org.